By pressing the Logo on the main screen the About screen appears. 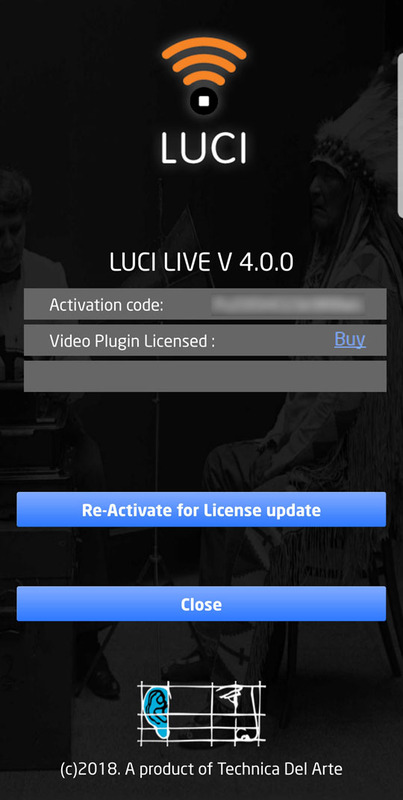 The About screen of LUCI LIVE tells you what version you have and gives you information about the developers. Check out the website www.luci.eu for the latest news on upgrades, updates, features and applications. LUCI LIVE is constantly updated to the latest IP technology and standards. All updates are free. Your activation code is also shown. When you want to transfer your license to a different device we need this code to positively identify your license and device. Also additional Plugin licenses are shown. You can buy these in our shop. Easiest way is to select the Buy link , so you get directly to the LUCI shop item with your activation code filled in. After finishing the purchase, press the Re-Activate for License update button and wait for a positive result.